The Christmas Season is well known for it’s seemingly endless supply of cookies. Spritz Cookies are on favorite among many. They have a rich buttery shortbread-like texture and a pleasant almond flavor. 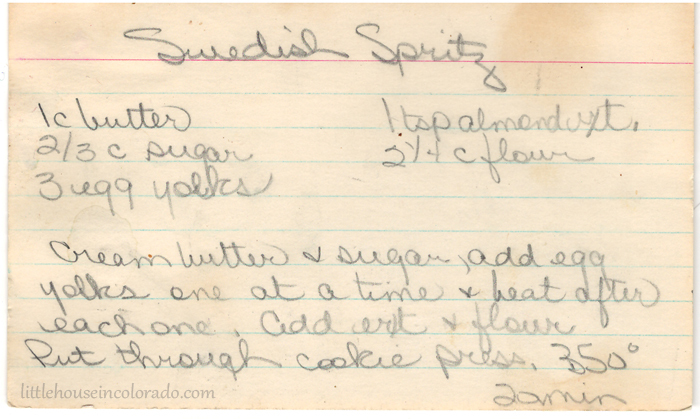 They are also known as Swedish Butter Cookies when made with vanilla extract. “Spritz” is German for “spritzen” which means “to squirt”. It seems an appropriate name because you will need a cookie press to make these cookies. If you do not have a cookie press, you can use a pastry bag fitted with a large star tip. 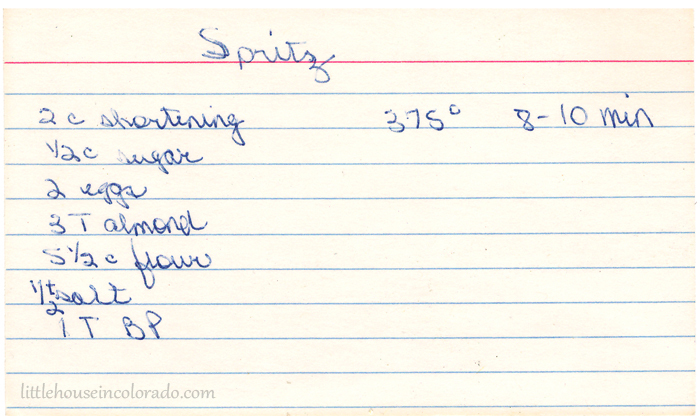 The following three recipes for Spritz Cookies were all handwritten on index cards. They were found together in an old large recipe file box. All the recipes have almond extract in them but you can substitute vanilla extract instead for a rich butter cookie. The ages of the recipe cards are unknown. 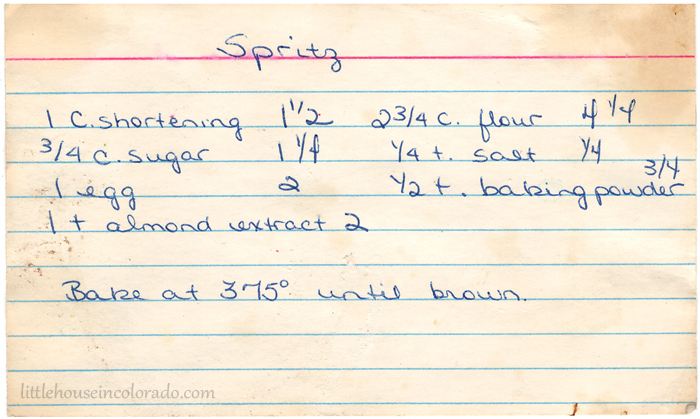 The original recipes have been scanned and are transcribed below. They can be printed for use in your own home kitchen. Enjoy! Add egg yolks one at a time and beat after each one. Put through a Cookie Press. This particular recipe card had adjustments made to it. The ingredients have the original measurement with the adjusted measurement beside it in parentheses. Combine all ingredients. Put through a cookie press. Bake at 375˚ for 8-10 minutes.